Flux Gallery is hosting two benefits in January 2011. 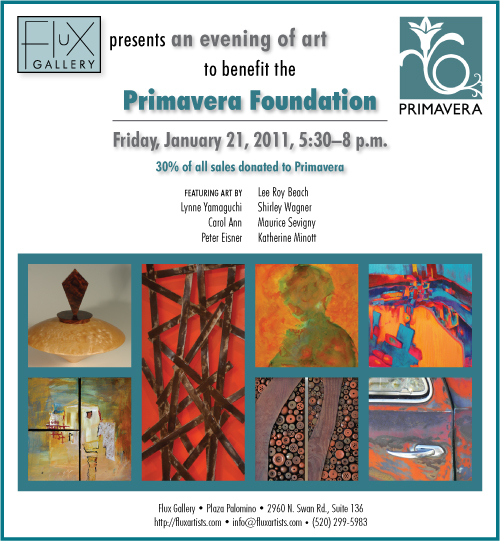 The first, on Friday, January 21, will benefit the Primavera Foundation. The second, on Saturday, January 22, will benefit the Ben’s Bells Project. Featured at both will be the art of Peter Eisner, Carol Ann, Katherine Minott, Lee Roy Beach, Maurice Sevigny, and Shirley Wagner, as well as, of course, my work, with 30 percent of sales of the artwork going to the organizations. The mission of the Primavera Foundation is to provide pathways out of poverty through safe, affordable housing, workforce development, and neighborhood revitalization. It addresses the systemic causes of homelessness by providing a continuum of services designed to move people out of poverty and into a self-sustaining life. These services include: street-level outreach, drop-in services, emergency shelter, transitional housing, permanent affordable housing, workforce development, financial education, homeownership opportunities, and neighborhood revitalization. Join us at Flux on Friday, January 21, from 5:30 to 8 p.m. to support this important and necessary organization. Add beauty to your home and help someone else find a home at the same time. Ben’s Bells are beautiful ceramic wind chimes, crafted and assembled by hand by people all over Tucson and beyond. By the time a Ben’s Bell is assembled, at least ten people have worked on it, making it a true community effort. Ben’s Bells are not for sale. Twice a year, hundreds of Ben’s Bells are hung randomly in public places around Tucson and beyond, with a written message to simply take one home and pass on the kindness. The only way to get a Ben’s Bell is to find one or to be “Belled.” To date, more than 17,510 Ben’s Bells have been released. The point? To remind people how much power they have each day to make the world a better place simply by being kind. 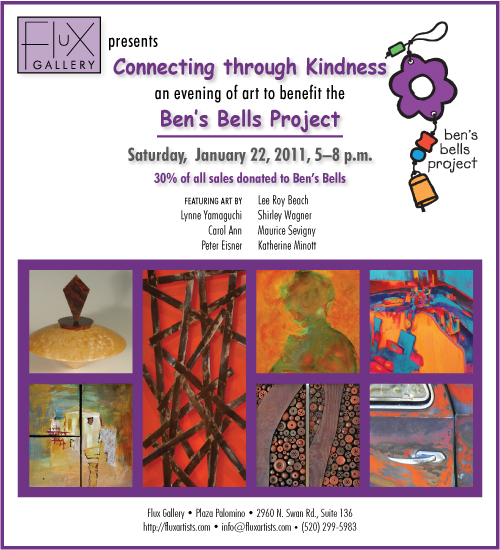 Help support this organization by joining us at Flux on Saturday, January 22, from 5 to 8 p.m., for “Connecting through Kindness: An Evening of Art.” Learn more about Ben’s Bells and how to get involved at their web site, bensbells.org. Flux Gallery is located at Plaza Palomino in Tucson, at the southeast corner of Swan and Fort Lowell Roads, in Suite 136, across from Dark Star Leather and next to Abstrax Salon and Day Spa. Its normal business hours are Monday through Saturday, 11 a.m. to 4 p.m.